There is a saying in Tibetan Buddhism that it is better to conquer one desire than to satisfy a thousand others. This seems to be the central message of an operatic masterpiece that rarely makes it to American opera houses. 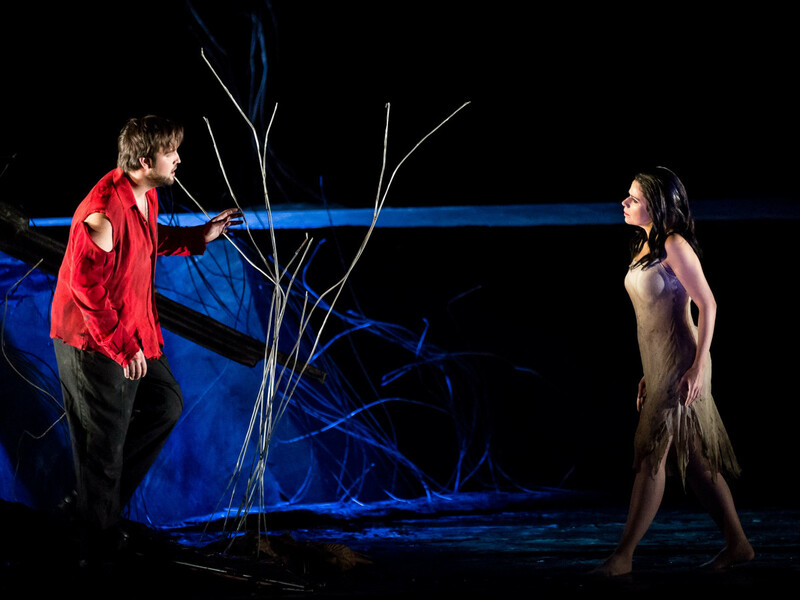 Billed as "A Lyric Fairy Tale in Three Acts," Antonin Dvorak's haunting Rusalka is back at Houston Grand Opera after a 24-year hiatus. It is no small feat to gather a cast and chorus to sing this lengthy work, in Czech no less. 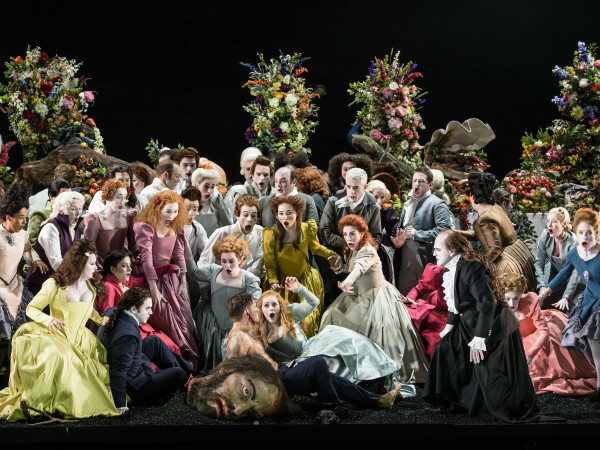 If you want to know how the work became a mainstay in Prague, or whether or not Rusalka conquers that one important desire, you really should not miss HGO's wildly imaginative staging. It is one of those works that serves as kind of portal into another branch of the operatic repertory. There is no mistaking its greatness within the first scenes, and it is never boring. At the opening night performance, I couldn't help but notice how much Rusalka takes a number of romantic and classical ballets as precedent. The central character, a ruminating water nymph, faces a dilemma not unlike that of Swan Lake's Odette, Ondine in Sir Frederick Ashton's ballet of the same name, and of course Giselle, the peasant girl who transforms into a Willi after dancing herself to death. All of these characters are summoned to compassion after some level of deep betrayal. The men they love are mostly thoughtless, selfish jerks, players of the worst kind. Along the way there are witches, spells, ghosts, and some kind of unresolved existential conflict between mortals and creatures. I am grateful now to add Rusalka to my list of favorite ill-fated romantic heroines, in both operas and ballets. Dvorak has also used certain musical conventions from ballet, such as announcing Rusalka's appearance on stage with a harp solo, just as Tchaikovsky and composers before him "announced" their prima ballerinas with the harp. Harpist Joan Eidman should be mentioned for her unforgettable, pristine playing on opening night; she is a treasure among some very great musicians. A rousing ball in the opera's second act continues for some time without any singing, and the brass melodies seem to echo Sleeping Beauty. This is not to suggest that Dvorak was unoriginal. 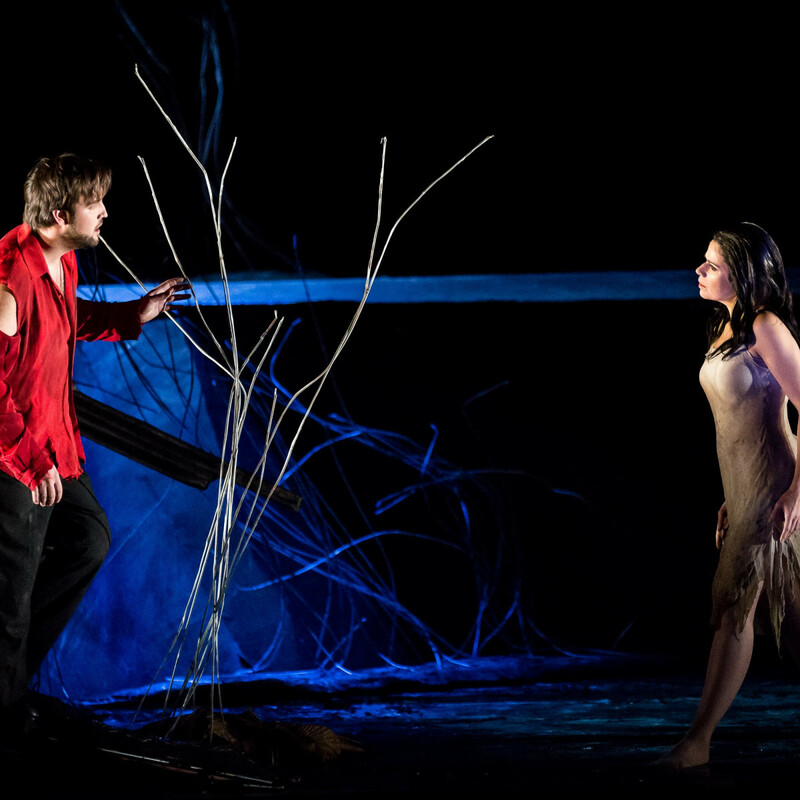 On the contrary, Rusalka seems in a class of its own, even if you can trace aspects of Debussy and Wagner throughout. Musically it seems to foreshadow some of Richard Strauss as well. The opera is best thought of, perhaps, in the context of the other great magical operas: Weber's Der Freischutz, Strauss' Die Frau ohne Schatten, Debussy's Pelleas and Melisande, Humperdinck's Hansel und Gretel, and others. 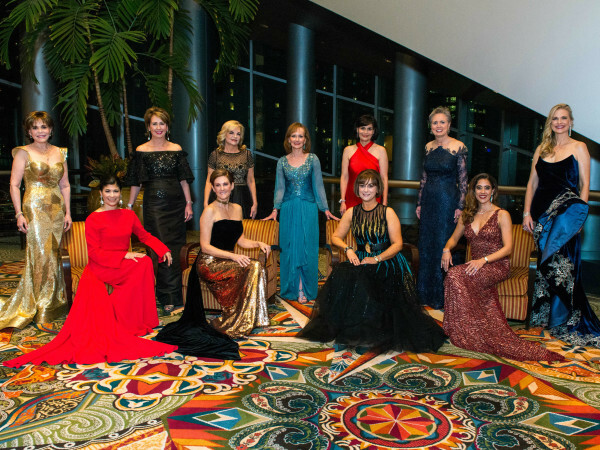 At least one of the cast members from HGO's 1991-2 season staging, which featured Renee Fleming in the title role, is back for this vivid production. 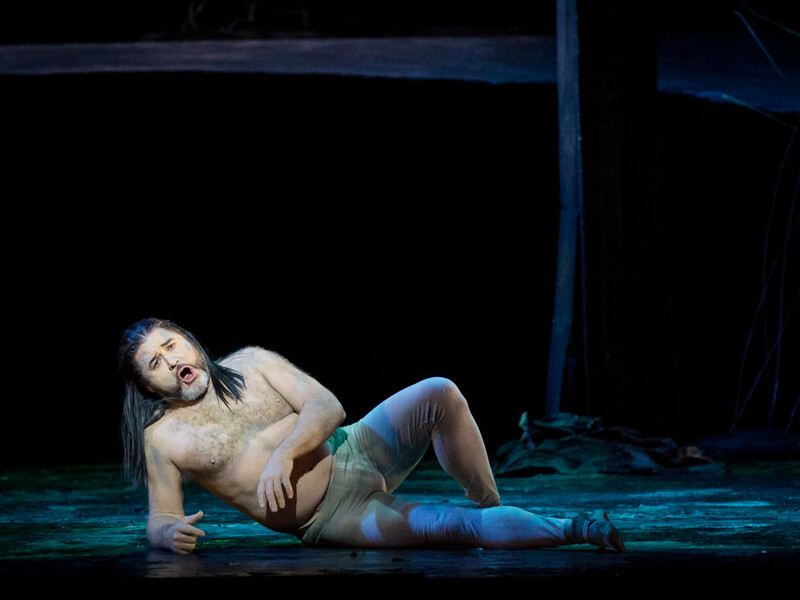 Baritone Richard Paul Fink makes an extraordinary impression as Rusalka's father, Vodnik. There is something brazenly heroic about his interpretation. 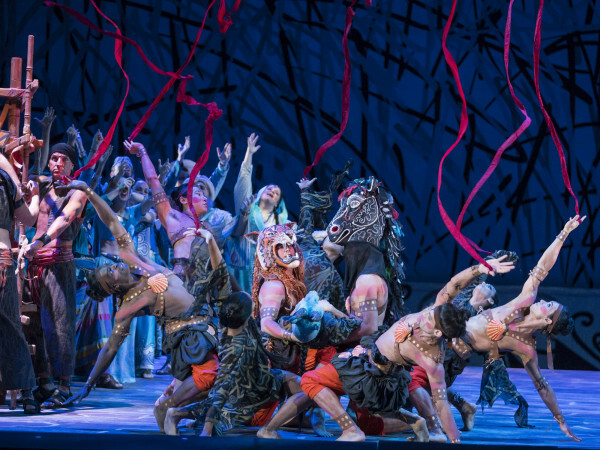 From the very opening of the first act, he approached the part with wild abandon, and it is not difficult to imagine him as Das Rheingold's​ Alberich, a role for which he is well known. Dressed in a kind of ivory unitard, he was entirely the "toady man" he is called for in the libretto, though I think he looked more like a frog's underbelly. Unforgettable. 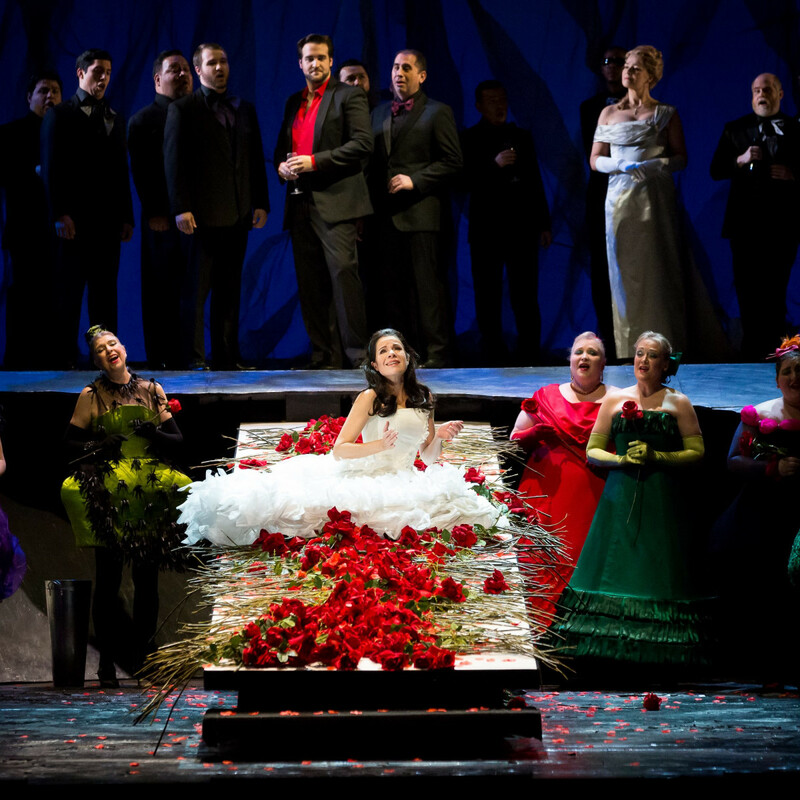 In the title role, Ana Maria Martinez is at once vulnerable and defiant. She was in excellent voice on opening night, delivering a number of show-stopping, deeply emotive arias. Watching her float through a series of dramatic gestures as an enormous fish (with the help of several talented stage assistants)before she transformed into a mortal struggling to walk in a pair of red platform shoes, was both weird and mesmerizing. I admire her for making something more of this role than mere sentimentality. By the third act, she was simply devastating, and vocally she never wavered. 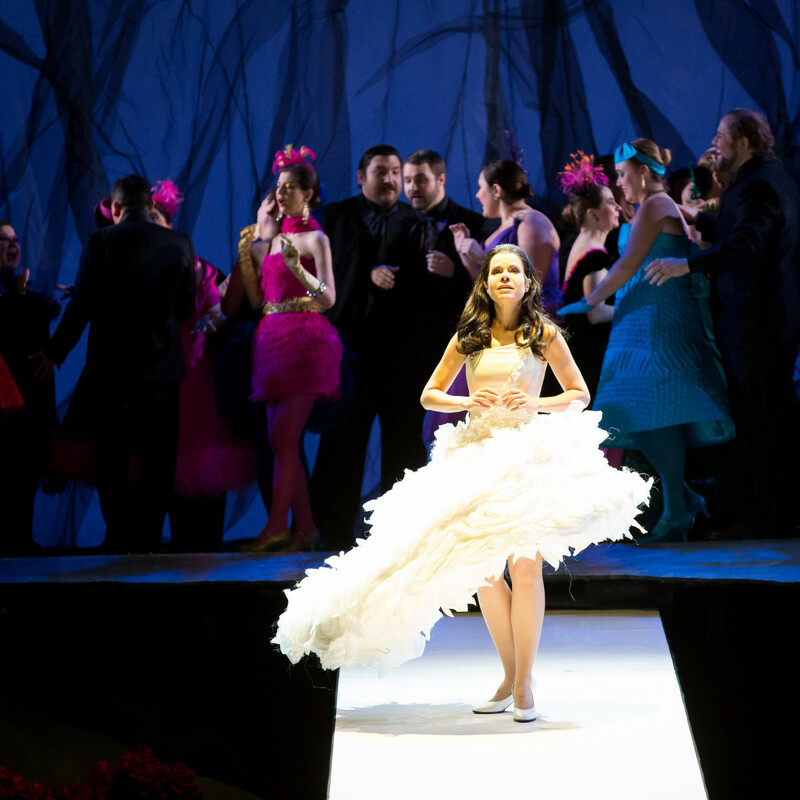 She was well-paired with Brian Jagde, an American tenor making his HGO debut as The Prince. This is perhaps the most stunning HGO debut I've witnessed this year. Jagde has a big, big voice, well-controlled, and it's safe to say that no orchestra will ever drown him out. A striking actor, he looks the part of an archetypal prince. The rest of the cast is also entirely top notch. Jill Grove is a terrifying Jezibaba, the witch who transforms Rusalka into a mortal. Aside from her thrillingly confident voice, she has a commanding deportment. The character is both comic and scary, she carries it off with sophistication. German soprano Maida Hundeling is a thrilling Foreign Princess, the one who seizes her former lover when Rusalka is doomed to silence. She isn't conquering one desire, she's pursuing the thousand others, clearly. 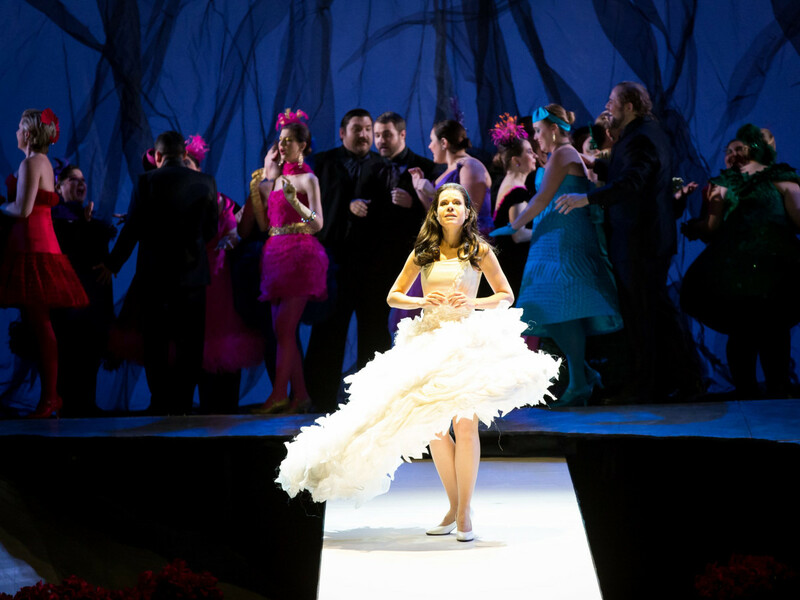 This Rusalka is also a great opportunity to enjoy the charms of the wonderful HGO chorus, particularly in the second act ball scene, where couples promenade downstage in a series of bizarre and colorful evening wear outfits. It is as if a kaleidoscope of psychedelic ornaments is rolling off some hidden Christmas tree. There is nothing particularly experimental about Melly Still's production, even if Rae Smith's sets and costumes lean towards the vividly artificial. It's a fairy tale, and it looks like one. The blocking is often dancerly, mostly in a very good way, thanks to movement director Rick Nodine and Ballet Master and Dance Captain Christian From. Harry Bicket is a suave conductor, you can see this quality in his audience acknowledgements alone. The orchestra players garnered that kind of energy from his presence and played with great finesse. 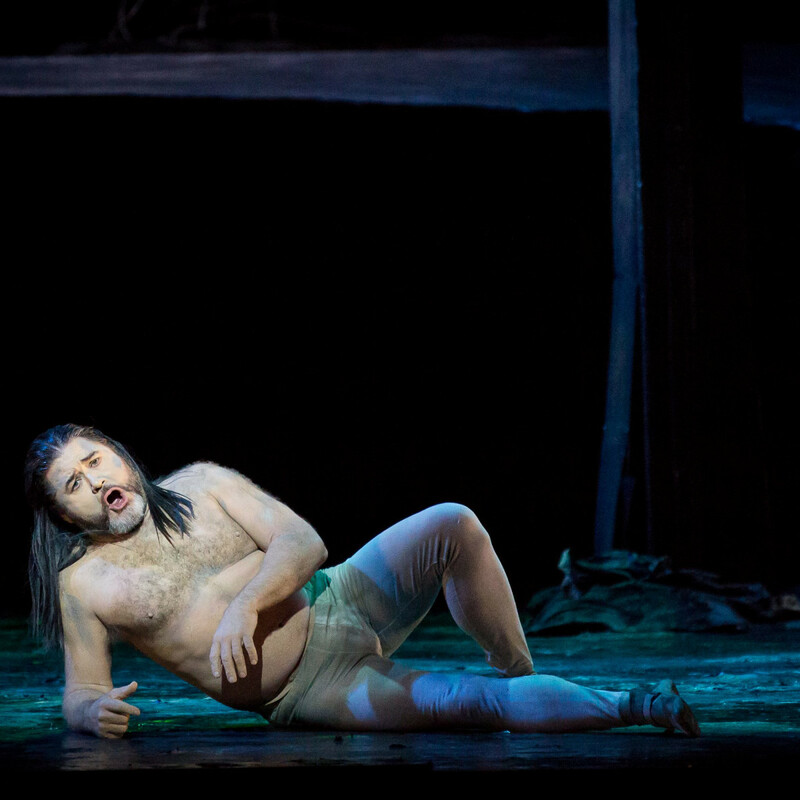 Rusalka continues through February 12. 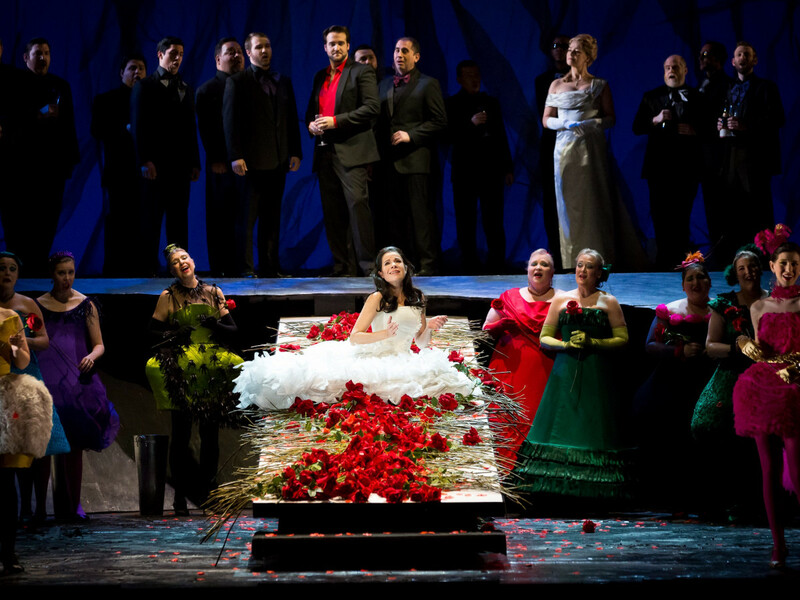 For more information, visit the Houston Grand Opera website.